We have always had cats and a dog in our family. They sit on seats with us, sleep in/on beds with us, go for walks with us, talk to us, wait for us to open the fridge, watch us, bring us their rodent and rabbit kills to us for approval, keep us company, and more. They share their moods with us. 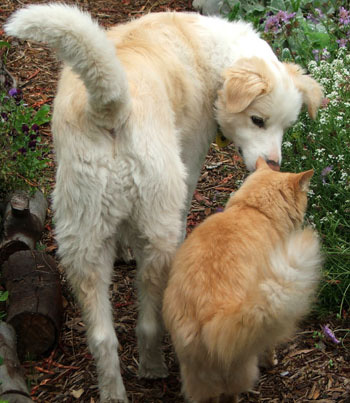 In fact they share so much with us (much more than cat hair, dog hair, and fleas) that our lives are richer every day. We love all the cats, and we love the dog. Everyone in our house talks to the cats and the dog. We explain things to the cats, we sing songs to the dog. When we first came to live in the country we brought four cats with us. Our vet had made a house call to get their cat flu injections up to date, and lent us a huge tiger sized cage for transportation. On arrival the two greys took up residence in the kitchen, Mugsy the tortoise-shell hid in the hot water cupboard in the laundry, and the big Ginger Puss escaped outside and installed himself under the patio decking. All was relativdely well. I realised immediately how much nicer a large country property was for all the animals. 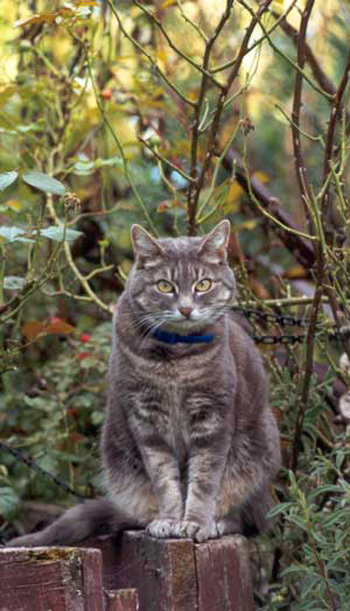 During the first weeks Mugsy stayed close to the house, but the other cats did some serious hunting, clearing the house paddocks of rabbits and the sheds of mice. Gingerpuss immediately proved himself as a great rabbiter, with incredible stamina. The dog raced around barking at the wind without disturbing any neighbours. Night walks up the road at night were traffic free, and his dog-soul could run free following his dog-nose. Country smells! The cats followed me around, inquisitive in those early gardening days. So the concept of cat company grew in importance, while the dog learnt a new phrase ('get orffffff the garden'). Now (many years later) I can't imagine being in the garden without one of the cats leaping out from the undergrowth to say hello, while another snoozes under the wheelbarrow. And the dog, canine vigilante, lying at the top of the driveway on guard, waiting for cars, or people, or whatever else might turn up. How could I ever be lonely?